Distiller’s dried grains with solubles (DDGS) are the nutrient rich co-product resulted from the ethanol production. Its utilization as a feed ingredient for livestock is well documented as both an energy and a protein supplement. DDGS also serves as a reliable and cost effective alternative for many animal feed ingredients. At Zernoff plant, after ethanol distillation finishes processing cereals; the non-fermentable components are collected and saved. These residues, once dried and mixed with the condensed liquid fraction from the distillation process, are the basis for the production of DDGS. The DDGS made at Zernoff plant contains high levels of protein, fat and fiber concentrations, making it a more easily digestible livestock feed. It is also an excellent source of energy and vitamins making it a good price for value feed for livestock in Europe and all over the world. Animal nutritionists highlight the broad-based benefits of feeding DDGS to livestock. Additionally, inclusion in livestock rations offers environmental benefits including reducing hydrogen sulfide and ammonia in piglet manure and reducing algae growth in lakes and rivers downstream of livestock operations. The latter effect occurs because DDGS have the highest digestible phosphorus of any livestock feedstuff. The equipment we use for creating our DDGS is of German quality and is provided by one of the best technology supplier of this kind in the world. Nutritionists suggest that DDGS can be used up to 15% in the poultry feeding. For additional details about poultry diets, please contact us and we will provide customized feedback. According to the nutritionists, swine diets can contain up to 15% of DDGS. For additional details about swine diets, please contact us and we will provide customized feedback. Cattle diets can contain up to 30% DDGS, depending on the other ingredients. For additional details about swine diets, please contact us and we will provide customized feedback. According to the nutritionists, aquaculture diets can contain up to 20% of DDGS. For additional details about swine diets, please contact us and we will provide customized feedback. Nutritional values and price relative to soybean meal make DDGS an attractive energy source. 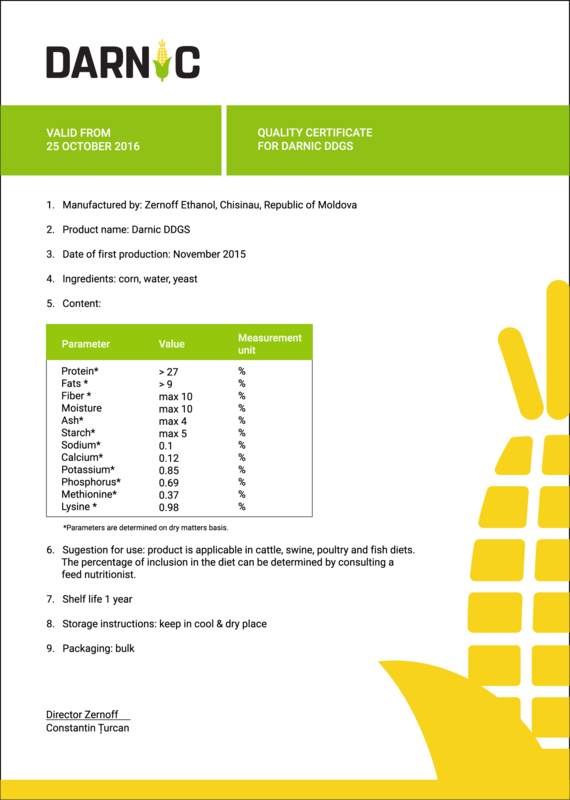 Constant quality of DDGS produced by Zernoff makes it a trustable product for farmers. A meta-analysis of nine experiments, where various levels of DDGS were fed to livestock, shows that DDGS produced higher average daily gain and gain-to-feed ratio compared with corn-based diets without DGS. Zernoff DDGS is made exclusively of local Non GMO grains. Proven track record by working with clients from the entire Black Sea region.